Liberty & Recognition for Edward Snowden: Worldwide Reading – Akl, facilitated by the internationales literaturfestival berlin and supported by writers around the globe including Noam Chomsky, Ulrich Schreiber, Martin Amis, Irvine Welsh, Claribel Alegria, Michael Ondaatje, Marina Warner and many more. 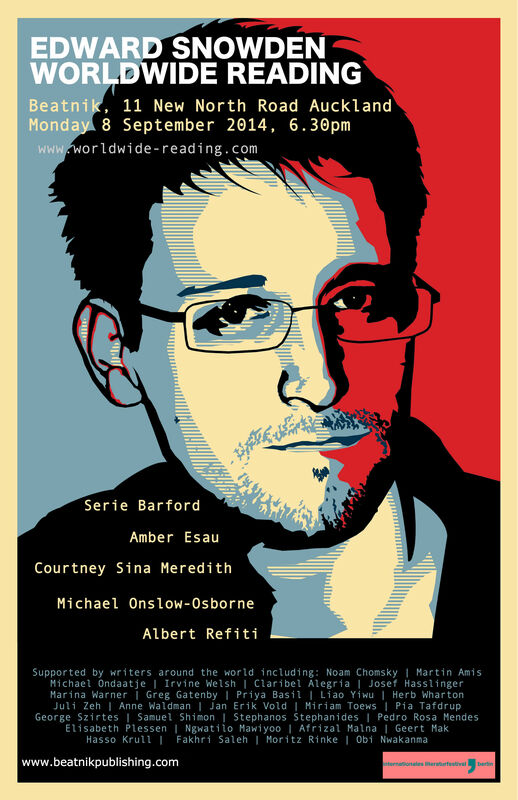 Join us for an evening of texts about surveillance in support of Edward Snowden with writers Serie Barford, Amber Esau, Courtney Sina Meredith, Michael Onslow-Osborne and Albert L Refiti at Beatnik Publishing on Monday 8 September 2014, 6.30pm. On the same date other readings will take place in Germany, Great Britain, Iceland, Colombia, Norway, Austria, Sweden, Serbia, Slovenia, South Africa and USA. With this worldwide reading, we call on the United States Government to recognize that Edward Snowden’s revelations are of essential importance for the safeguarding of democracy in the digital age, and thus that his actions must be seen to be covered by the Universal Unwritten Rule of the Ethical Right. Washington should therefore immediately lift all legal charges and complaints against Snowden, so that he can return home safely as a free man. We further demand that the Member States of the European Union, in recognition of the importance of his revelations, immediately grant Edward Snowden asylum in the EU, for as long as he may need it and at least until the US Government has lifted all charges against him. Finally, we ask that the Nobel Committee consider Edward Snowden for the Nobel Peace Prize – in recognition of his amazing, selfless service towards democracy, freedom and peace for us all.